It’s a bird! It’s a plane! 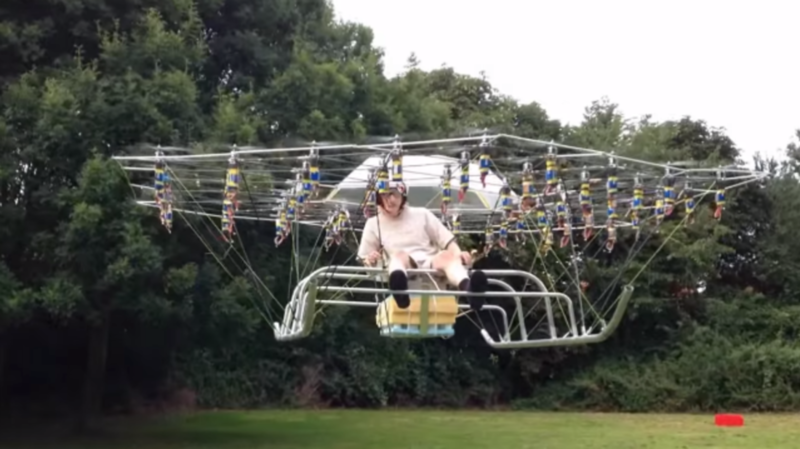 It’s...a middle-aged British man in what looks to be a modified lawn chair powered by dozens of toy helicopters. Just as Orville and Wilbur Wright first proved the possibility of human flight on a beach in Kitty Hawk, North Carolina, YouTuber gasturbine101 has answered the unasked question–“Can 54 drone rotors be assembled in such a way that they lift a seated human being into the air for a sustained period of time?”–with a resounding yes (disregarding the perhaps equally important, though much less fun, question of “But why would you?”). As silly as the pentacontakaitetracopter (derived from the Greek words for a 54-sided polygon and “copter,” coined by a clever Reddit wordsmith) setup looks, it’s a serious piece of kit. The inventor/flight tester chose 54 rotors in order to arrange them neatly along a hexagonal plane; there’s room in the center for 6 more, but he wisely chose to install a polycarbonate dome instead to protect his head. The dome also contributes to the aircraft’s overall lift by “catching some ground effect pressure rise,” and “also doubles as a rain shelter”—after all, this test flight did take place in England. The aircraft weighs 148 kg or about 326 lb, but can carry an additional 164 kg, or 361 lb, enough for a pilot and maybe a friend. Though the video shows only a few seconds of the copter in flight at a time, the creator claims it can make a journey of up to ten minutes, putting Wilbur Wright’s first day flight record of 59 seconds to shame. Gasturbine101 admits that there is no higher purpose to his project, which he undertook as “just a bit of fun for [myself], never intended for making a significant journey or flying much above head height.” As far as backyard stunts go, this is a pretty costly one: Gasturbine101 estimated the project cost at £6000, or roughly $10,000. However, if that budget isn’t deterrent enough, it should explicitly be said that this is not a project anyone should try at home. The video’s cameraman—who can be heard at around the 2:25 mark yelling, “Paul! Paul, be careful!”—would likely say the same.